I only realized as I was typing the title to this post that all of the ingredients in this cookie start with C! I did not do that on purpose, but it does make a fun alliteration. These cookies were made when at 9:30 one night I decided I really wanted homemade cookies, despite the fact that I was planning on going to bed in an hour. I happened to have a container of some dried cranberries, coconut, and chocolate chips in my fridge, so I decided just to throw them in some batter, and thus, Chocolate Chip Cranberry Coconut Cookies were born. And then I chopped up another bar of chocolate and added that as well, just for good measure. I’m completely guestimating the amount of ingredients used, as I didn’t measure the add-ins at all. Mine had very little coconut, but I would definitely suggest adding some more, as when the flavor comes out it really adds to the overall cookie experience. Your batter will not look exactly like this if you remember to add flour. I got the recipe from this chocolate chip recipe on All Recipes, just because that was the first thing that came up when I googled chocolate chip cookies. I used the basic batter as a starting point, and it turned out very well- the cookies were chewy and crispy at the same time when first out of the oven, and lasted very well for the next few days (I know, because one night I ate about 4 while I was waiting for my dinner to cook). I have to admit though, these were very nearly a complete cookie failure, because the first time I scooped out the cookies onto my baking sheet I realized I had forgotten to add flour. 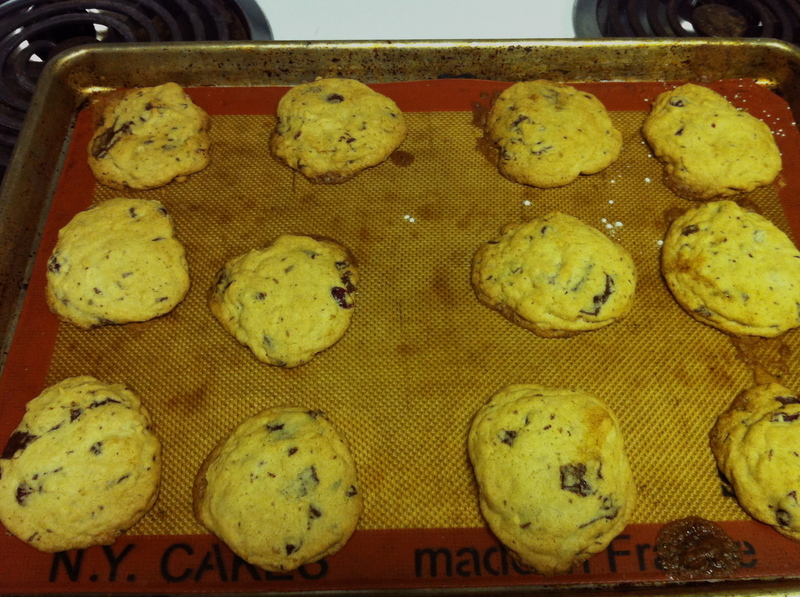 In case you are not familiar with baking, the flour is a pretty important ingredient in basically any cookie. I blame the fact that I was rushing in my cookie-craving state, and also that I was distracted by how good the sugar and butter mix tasted that I forgot I was missing the main ingredient. Luckily I realized before putting the sheet into the oven, otherwise I would have had a very buttery messy situation on my hands. If you’re looking for a cheap gift for anyone for the holidays, these would be a great holiday cookie to make and wrap up nicely! They only take about 30 minutes from start to finish, and as long as you remember the flour, they are pretty much foolproof. Preheat oven to 350 degrees. Cream together the butter, white sugar and brown sugar until smooth. Beat in the eggs one at a time, then add the vanilla. Dissolve the baking soda in hot water, and add to the batter along with the salt. 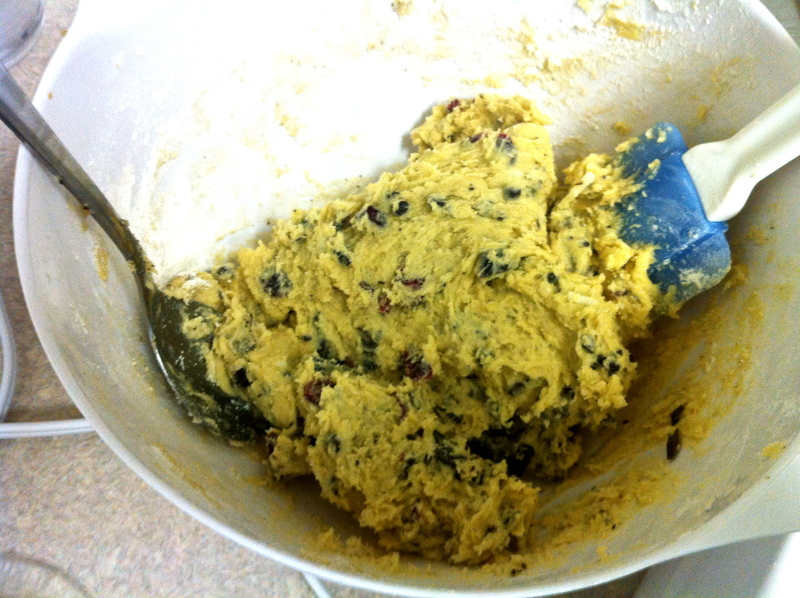 Beat to incorporate, then stir in the flour, chocolate chips, cranberries, and coconut (with a wooden spoon or spatula). 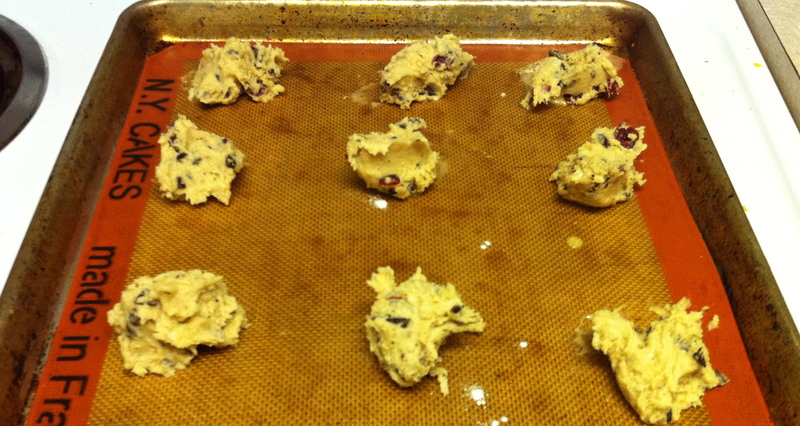 Drop by large spoonfuls onto a cookie sheet lined with parchment paper or a silicone mat (but not greased). Bake for about 10 minutes, or until the edges are brown. Cookies will keep for a few days in an air-tight container at room temperature. Megan brought her own ingredients. And zester. 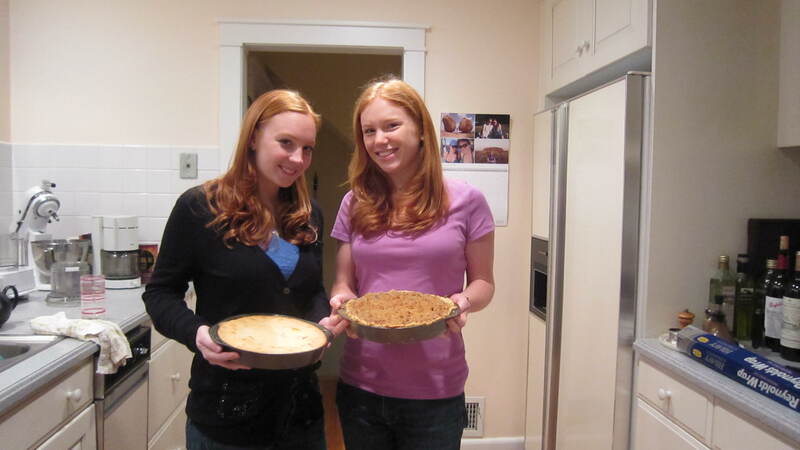 that my friend Megan was going to be home on the Wednesday before Thanksgiving as well, I proposed a pie bake-off. This basically meant that Roxie, Megan, and I all gathered in our kitchen to simultaneously make pies, which predictably turned out rather crazy. We ran out of sugar, and I think we’ll need to pick up some more butter before the real Thanksgiving cooking begins. There was pie crust being rolled out on every surface and manic pleas for another clean mixing bowl, but somehow we got three pies in the oven safely and they all look delicious. Unfortunately, we can’t actually judge the bake-off until after tomorrow—but seeing as both families are only having four or five people at their dinner, and three pies each, I’m sure we’ll have some leftovers to trade. Gina: "Wait, I have to look serious while I'm peeling"
Roxie was planning on trying to make a pecan pie this year, but our mother bought a pecan chocolate pie the other day so, alas, she will have to conquer that next year. 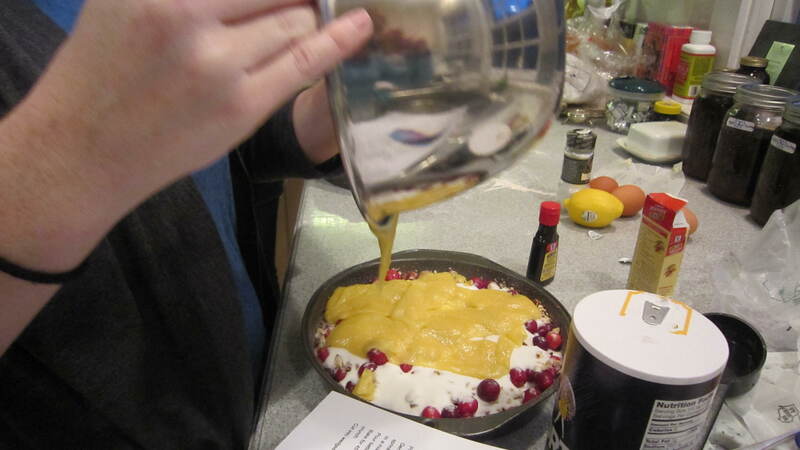 Instead she made a Nantucket cranberry pie, which is not so much of a traditional pie as it is lots of sugar piled over cranberries with cake batter on top. Whatever it is, she already ate too much of the batter because it tasted so good and now reports that she feels slightly sick. Roxie putting the finishing touches on her pie. 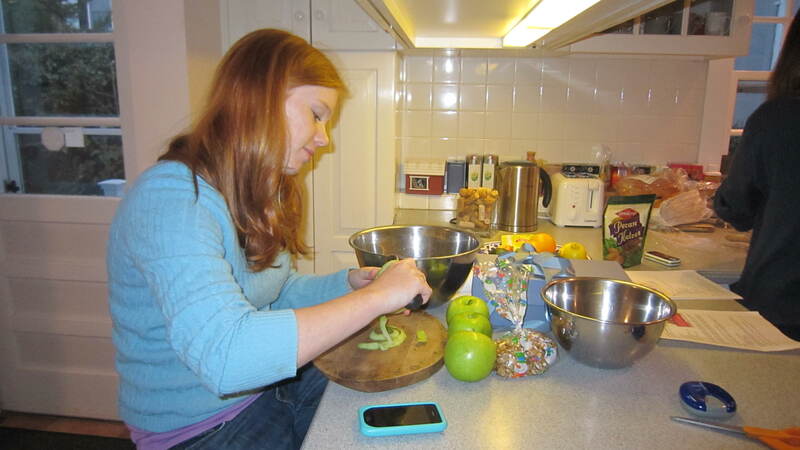 I am making an apple cream pie with a pecan crumble topping and many decadent things like heavy cream as well as sugar, eggs, etc, and Megan is making a lemon meringue pie. I made the all-butter crust Roxie posted here previously for both of these pies, although after making it I started worrying about the fact that Megan’s Aunt Heather is a baker and will be very judgmental about my crust. I also made it in a food processor instead of by hand, but it looked like it came out pretty well. 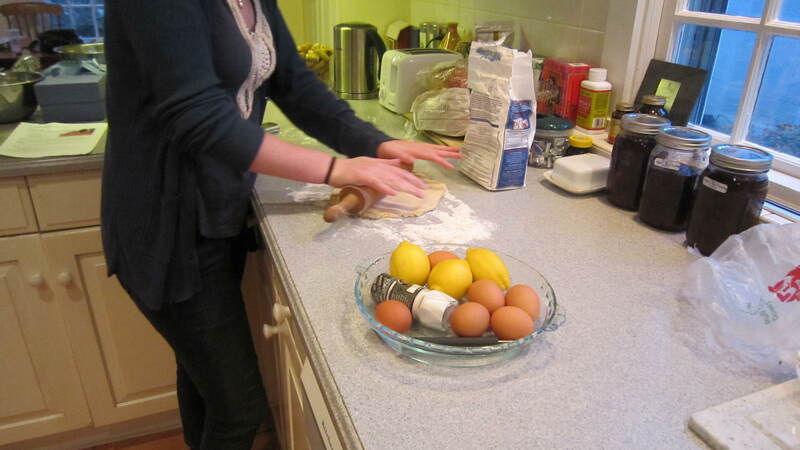 We par-baked Megan’s pie crust while she was furiously making the lemon curd, which was scary but seemed to work. We covered it with foil and put beans in the crust for the first 20 minutes, and then took off the foil and let it brown for another 10 minutes. Although it puffed up a bit, I am confident by the look of the end product that everything has worked out fine. Amazingly, even though the kitchen looked like a tornado of sugar and flour for a couple of hours, it is all cleaned up now in preparation for the storm of cooking our family will be doing tomorrow. We will be posting some pictures of the madness tomorrow, as well as a possible Father Spice guest post. 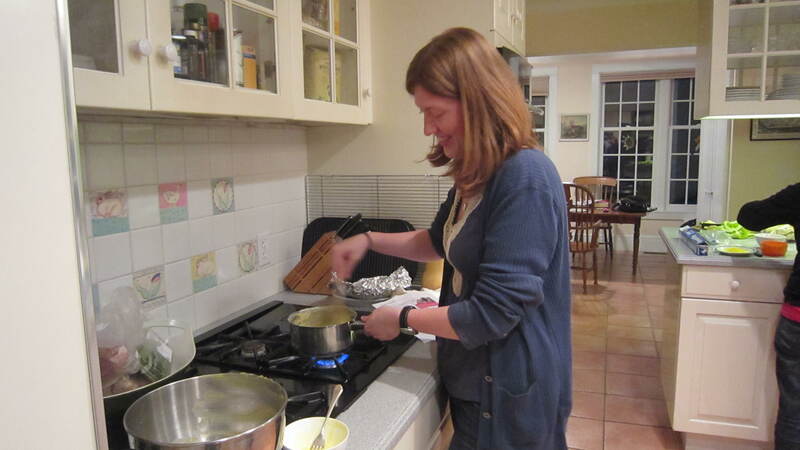 Happy cooking (and eating) everyone!